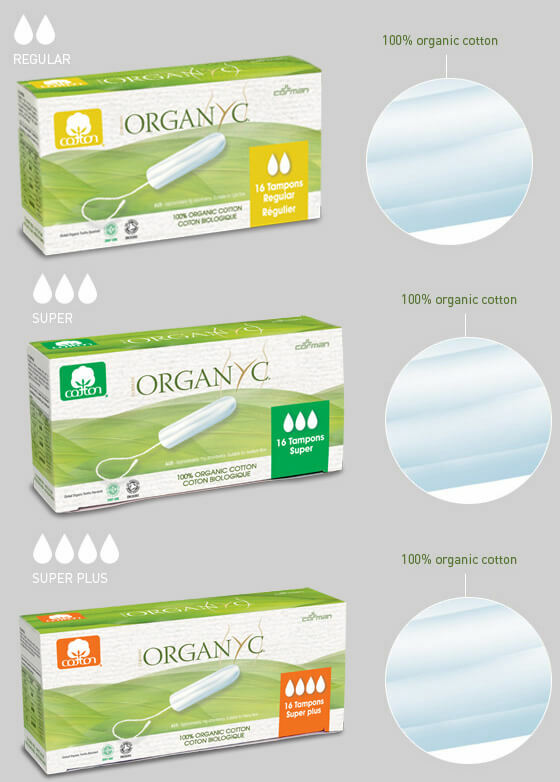 Organyc sells their pads and tampons in more than 26 countries around the world and growing. 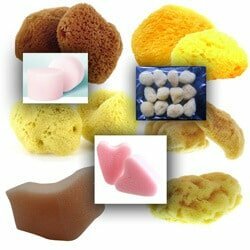 They’re manufactured by an Italian company called Corman SPA that’s specialized in working with cotton for wound care and hygiene use since 1947. Today their products are top-sellers in Italian pharmacies and are recommended by gynecologists and dermatologists worldwide — especially for women suffering from skin sensitivities or allergies. 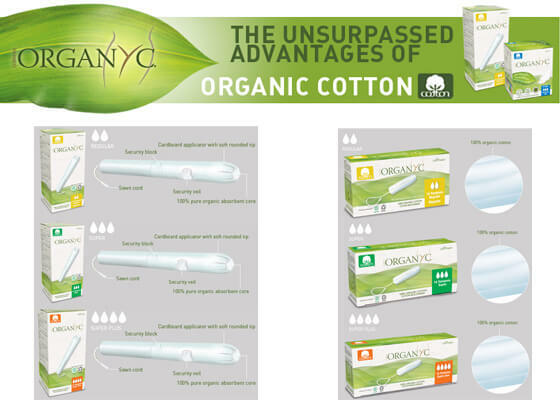 Organyc claims that their line of feminine products is the first to be entirely made of 100 percent biodegradable and compostable organic cotton that’s also not bleached with chlorine. 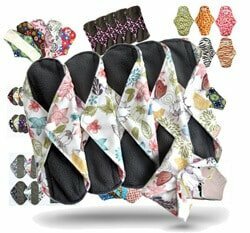 They feature a 100 percent cotton absorbent core, a security veil to prevent any chance of fiber shedding during wear, and sewed on string. 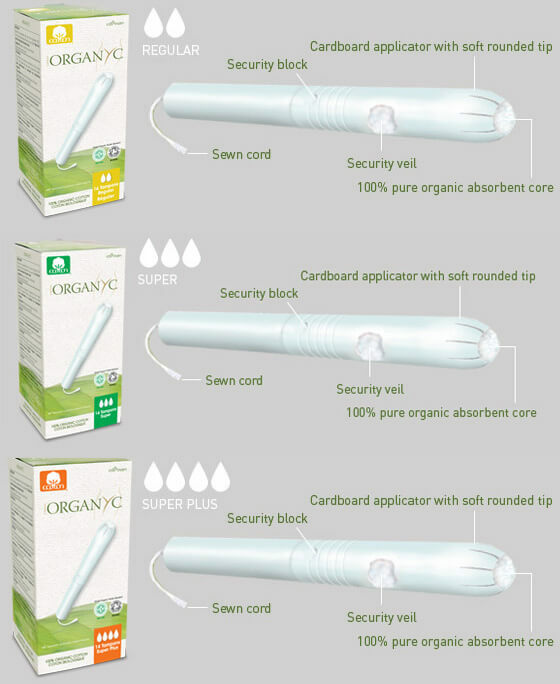 The applicator has a soft, rounded tip for comfort during insertion, so even though it’s made from biodegradable cardboard, it’s designed to feel more like a plastic applicator, which many women find more comfortable to use than cardboard ones. 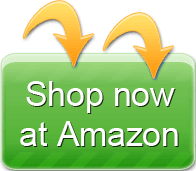 Customers say that this applicator is as smooth as plastic. It’s easier to insert if you twist the applicator before using it. There’s a small notch punched through the two tubes that holds the applicator together; if you twist the applicator it frees the two halves from each other and makes it easier to insert the tampon. 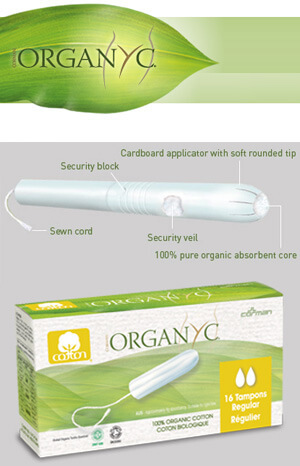 Several customers say that these are higher quality than many other brands of organic tampons. I have just bought the 24 pack pantyliners on 22 feb 2019 (in France) and am dismayed to find that they are no longer the same quality as before but the price is the same ! The pantyliners are half the thickness they were before and they are so thin that they rattle around in the box. The box is more than a third empty !You can see through the outside edges as they are so thin. I cant see how they are going to be as absorbant/comfortable as before. This is not good customer serviceto provide the same outside packaging and give less than half the original product. This is deception. For a product that is supposed to be ‘natural’, it is disappointing to observe that the marketing is not natural and yet again we are being exploited by a change in product quality and no chnage in price ! 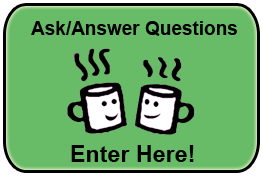 - CONS: The applicator is horrible; it's hard to get the tampon out of the inner tube. Would not recommend.